Villa Arataki is a stadium-type vacation residence where the main structures are built along the borders of the rectangular property – creating a focal point for the villa’s main attraction or feature. 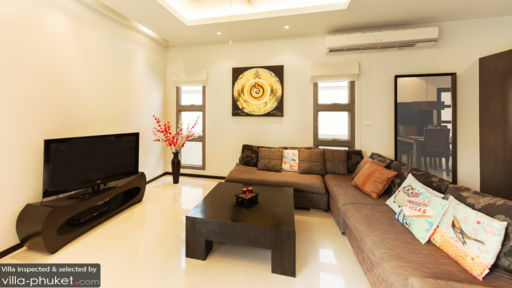 Indoors, throughout the villa, the areas and rooms are quite spacious. Appointments, furnishings and interiors are well-coordinated -- adhering to the predominant and pleasing color scheme of contrasting dark and warm hues and shades. Truly, Villa Arataki was designed to delight you with utmost enjoyment and comfort. The villa has three bedrooms. Two are at the main villa. One other bedroom occupies the separate unit across the swimming pool. All bedrooms have king-sized beds and dedicated bathrooms. At the center of the villa – surrounded by the main structure and a separate unit – is the eight-meter swimming pool. Directly accessible to you wherever in the villa you may be, you can, on a whim, simply jump in for a soothing dip. Or to wade aimlessly, float around or splash about. 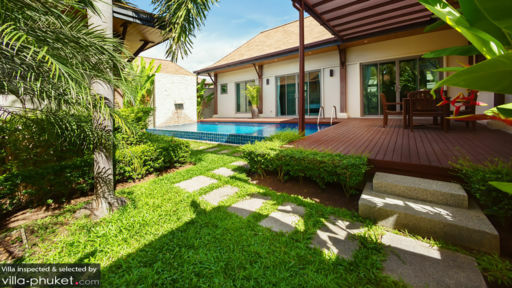 Out of the water, you can cool off as you relax on the wooden pool bed or settle comfortably with a refreshing drink by the wooden table at the covered wood-decked terrace. Indoors – right from the swimming pool and the covered terrace – is the living area. Here, you all can converge for the telecast of the hit series you’ve been following. Further inside – towards the back of the villa – is the dining area. On the wooden dining table that can comfortably accommodate up to six, you can serve your very own culinary specialties which you concocted at the kitchen – installed by the nearby wall. On hand for the villa’s maintenance and upkeep is a housekeeper, a pool attendant and a gardener. Also on regular duty are security personnel. 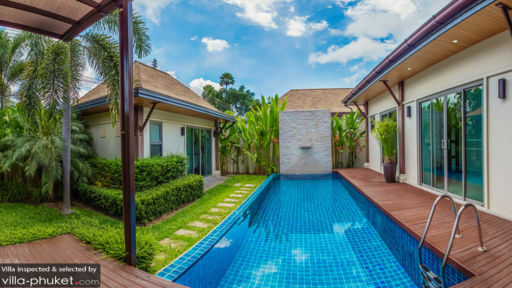 Villa Arataki is located close to Nai Harn – a white-sand beach ideal for swimming. Here, you can also hop aboard a traditional Long-Tail Boat and venture out to sea for an island-hopping tour of nearby Ko Bon, Ko Kaew, Ko Lon, Ko Aeo and Ko Hae – which is also known as Coral Island. Nai Harn is also known for really delicious seafood. Check out the specialties at Sala Loi where you can also get to experience the traditional way of dining – from a mat on the floor. Spend the afternoon at the Phuket Shell Museum and at Promthep Cape View Point just in time to catch the magical sunset.